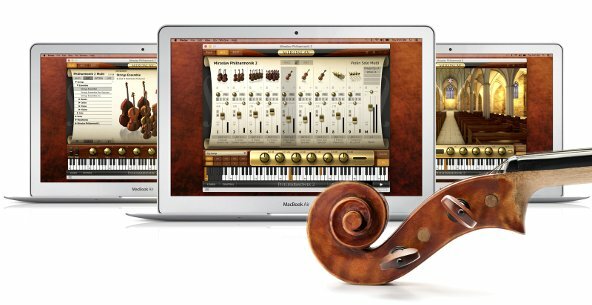 November 9, 2015 – IK Multimedia is proud to announce Miroslav Philharmonik™ 2, the next-generation of the most emotionally expressive orchestral collection for Mac/PC. Made in conjunction with master musician Miroslav Vitous, it comes with over 1,000 new sounds that include soaring strings, animated woodwinds and majestic brass in both solo and ensemble forms. In total, it offers a remarkable 55GB+ content library with over 2,500 instruments sampled in stunning high-resolution audio with multiple articulations plus over 30 professional quality effects, 3 powerful playback engines, a synthesizer section, a built-in mixer and a whole lot more. Miroslav Philarmonik 2 is a sweeping vision from a master artist embodied in a new virtual instrument that puts the full emotional range and humanity of a symphony orchestra at musicians’ and composers’ fingertips. Each of these new sounds has been recorded at the Czech National Symphony Orchestra, a space that’s been used by such legendary figures as Andrea Bocelli, Ennio Morricone, Lalo Schifrin and, of course, Miroslav Vitous himself. Miroslav Philharmonik 2’s instruments and sounds are able to convey the emotion and humanity of the musician behind each note. This makes it a perfect choice for when a more delicate or expressive touch is required: Like when scoring tragic love stories, recording romantic R&B ballads or adding symphonic grandeur to gothic metal anthems. Miroslav Philharmonik 2 includes over 30 professional-grade studio plug-in effects from IK Multimedia’s acclaimed SampleTank 3 sound and groove workstation. These effects encompass the full range of the sonic spectrum and include equalizers, dynamic processors, filters, modulation effects, reverbs, delays and more. It also includes 4 of the best analog-modeled mastering effects from IK’s acclaimed T-RackS mixing and mastering suite for complete, in-the-box mixing. Miroslav Philharmonik 2 uses the same Play, Mix and Edit pages as SampleTank 3. These pages give musicians an extreme amount of intuitive creative control over Miroslav Philharmonik 2’s orchestral sounds. It comes with an easy-to-use instrument browser, a 16-part DAW-style mixer with per-channel effect slots and global send/return and a powerful synthesizer section with 3 sample playback engines and 10 high-quality filters. With the synthesizer, musicians can quickly and easily transform a simple trumpet into a massive synth lead or a mighty brass ensemble into a dreamy pad – Miroslav Philharmonik 2 literally lets composers explore the furthest reaches of their creative minds. Miroslav Philharmonik 2 has been designed to be experienced with IK’s growing range of companion hardware controllers. Keyboard players will love the effortlessness with which its instruments pair with IK’s iRig Keys, iRig Keys PRO, iRig Keys 25, iRig Keys 37 and iRig Keys 37 PRO keyboard controllers. Now musicians can have a responsive and thoroughly tactile piano experience – complete with world-class grand piano sound – anytime and everywhere. This entry was posted in Plug In, Samples Libraries, Software, Vst and tagged colonna sonora, ik multimedia, miroslav philarmonik 2, orchestra, soundtrack. Bookmark the permalink.